(Nanowerk News) Three dimensional printing is revolutionizing the production of new devices and structures, including soft robots, flexible electronics and engineered tissue replacements, but advances have been challenged by the inherent complexity of integrating multiple materials. Now, breaching the next frontier in 3D printing, Jennifer A. Lewis, Sc.D., has designed new systems to actively mix and print concentrated viscoelastic inks that, for the first time, allow for the simultaneous control of composition and geometry during printing. Lewis is a Core Faculty member at the Wyss Institute for Biologically Inspired Engineering at Harvard University and the Hansjörg Wyss Professor of Biologically Inspired Engineering at the Harvard John A. Paulson School of Engineering and Applied Sciences (SEAS). The goal of integrating different material and structural properties within printed objects has demanded the invention of new, flexible printing platforms. For example, to print a functional "wearable" device including its electronic components, a 3D printer would need to seamlessly transition from the flexible material that moves with the wearer’s joints to the rigid material that holds the electronic components. It would also need to embed electrical circuitry with multiple inks of varying conductivity and resistivity, precisely switching between them. And, it would be ideal to do all of this inside one continuous print job with active mixing of complex fluids. But until now, most mixing approaches are passive, so that two streams of fluids converge into a single channel where they undergo diffusive mixing. This method works well with thin, flowing fluids with low-viscosity, but is ineffective with thicker, high-viscosity fluids like gels, especially in small volumes over short periods of time. 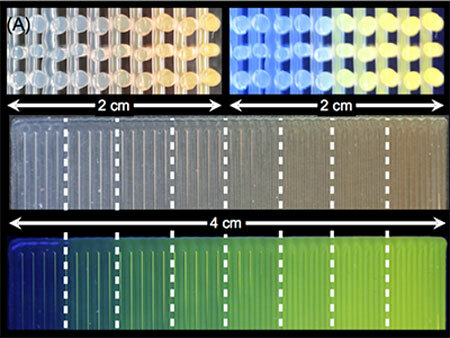 To address this challenge, Lewis and her team designed a new multimaterial printhead based on active mixing, Her team included Thomas Ober, former Postdoctoral Research Scholar at the Wyss Institute and SEAS; and Daniele Foresti, Postdoctoral Fellow at SEAS. The work was published September 21 in The Proceedings of the National Academy of Sciences (PNAS). "Passive mixtures don’t guarantee perfectly mixed materials, especially highly viscous inks," said Ober, the paper’s first author. "We developed a rational framework — and verified it experimentally — for designing active microfluidic mixers that can mix a wide variety of materials." 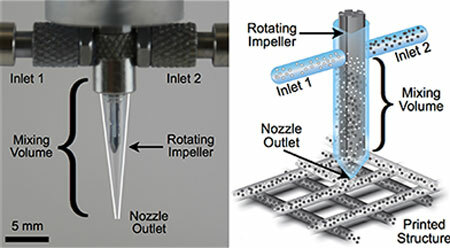 The active printhead efficiently mixes a wide range of complex fluids by using a rotational component inside a microscale nozzle, which enabled the team to print heterogeneous materials in three dimensions. The research team demonstrated several uses of their active mixing technology. They showed that silicone rubber can be seamlessly printed into gradient architectures composed of soft and rigid regions. These structures may find potential application in flexible electronics, wearable devices, and soft robotics. They also printed reactive materials, such as two-part epoxies, which typically harden quickly when the two parts are combined. Finally, they showed that conductive and resistive inks could be mixed on demand to embed electrical circuitry inside 3D printed objects. "Jennifer’s latest technical advance enables fabrication of objects composed of different types of materials that are absolutely required for optimal function, yet could not be integrated seamlessly into a single unitary object with 3D printing in the past," said Wyss Institute Founding Director Donald Ingber, M.D., Ph.D., who is the Judah Folkman Professor of Vascular Biology at Harvard Medical School and Boston Children's Hospital as well as Professor of Bioengineering at SEAS. "Her creativity and leadership have already transformed the realm of 3D printing, and once again, she and her team have opened another new path for this emerging field to explore." Lewis and her team also recently designed another printhead that can rapidly switch between multiple inks within a single nozzle, eliminating the structural defects that often occur during the start-and-stop process of switching materials. "This printhead design eliminates the need to align multiple nozzles as well as start and stop ink flow on demand," said James Hardin, first author of a recently published paper in Advanced Materials that reported the advance. In addition to Hardin, the work included Ober, former SEAS Postdoctoral Research Fellow and current Wyss Staff Scientist Alexander Valentine, and was led by Lewis. "Together, these active mixing and switching printheads provide an important advance for multimaterial 3D printing," said Lewis. "They allow one to programmably control both materials composition and structure at the microscale, opening new avenues for creating materials by design."